When it comes to tourist attractions in Kliptown, tourists most often visit the popular historical sites. However, there are other places of historical significance that are not on the usual tourist route, and are located in the squatter camps. “Town, town, are you going to town?” taxi drivers hoot their Siyaya horns enthusiastically, ceaselessly, loudly enough to rupture your eardrum. “One town” says a taxi driver with his scraggy arm hanging out of the window, he moves his index finger and points up trying to get a passenger to fill up his raggedy taxi. Welcome to Kliptown. Kliptown is vibrant and enveloped by the spirit of hustling. South of the Walter Sisulu Square, people walk through the meticulously paved square of dedication, some selling, others buying, while others are standing and gazing at the surroundings looking uncertain, with facial expressions of despair. Today, the centre of the township has been declared a heritage site and is known as the Walter Sisulu Square or Square of Dedication, a R375-million, architect-designed area that commemorates the place where on June 26, 1955 more than 3 000 people from different ethnic and religious organisations assembled to adopt the Freedom Charter. The square attracts busloads of tourists. There is the other side of this township, one that is out of the limelight and off the beaten track for tourists, yet carries iconic stories and a history of what the township once was. Kliptown is one of oldest districts in Soweto and was established in 1903. It is referred to by its inhabitants as the first rainbow nation, as it was originally a home of Indians, Coloured, Blacks, and Chinese. In spite of the rich history and heritage, and standing as the home of the Freedom Charter, Kliptown is steeped in pervasive poverty, unemployment and violence. 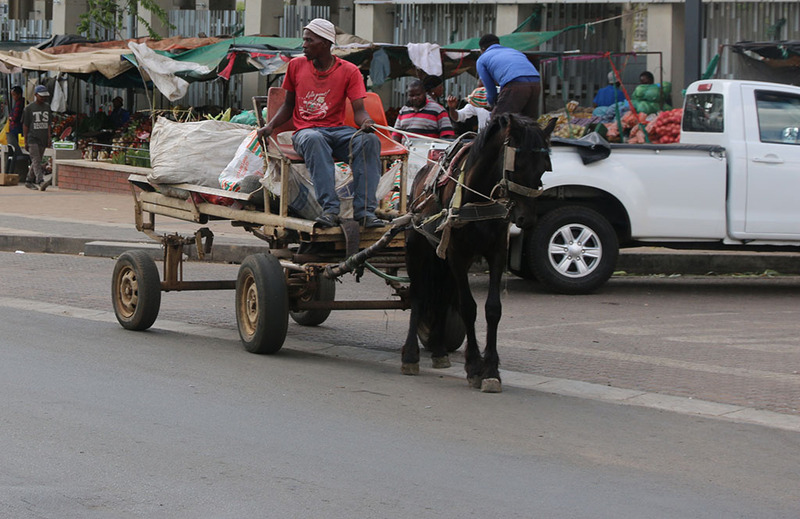 NOT DONKEY WORK: A donkey is a cheap mode of transport for vendors. One old building that resonates with the history of Kliptown is the San Souci Bioscope. Hollow and unsteady walls and dusty cracked floors are the only remains of what was once a centre of entertainment. The bioscope is situated in the west of Kliptown, 15 minutes walking distance from the Walter Sisulu Square. “During the holidays there was nothing to be done in the townships, the only place for entertainment and to watch movies was Kliptown, San Souci Bioscope,” says Carl Tarr, a 61-year-old who lives three houses away from the bioscope, and use to frequent the bioscope when it was still operating. Established in the 1950s, the bioscope quickly became a meeting spot for people in Kliptown and surrounding areas. “At that time there was no Eldorado park, there was no Soweto. There was only Kliptown, Chiawelo, Pimville and Dlamini. These were the people who attended the bioscope,” Tarr explains. The interior design of the bioscope was made up of three sections, the costly section was the gallery section for the ‘big guys’, then the ground floor, consisting of wooden benches and ordinary cinema chairs. This small bioscope became the center of trade, hustlers using the spot to sell food, and also a space for concerts and music festivals. “You will find five queues, and the fee was 25 cents. You will find that other people are gentlemen and ladies and wait at the queue,” he laughs vigorously. “There was a lady who used to sell pies. The best way to treat a lady was to buy her cool drink and that round red cake,” he continues. 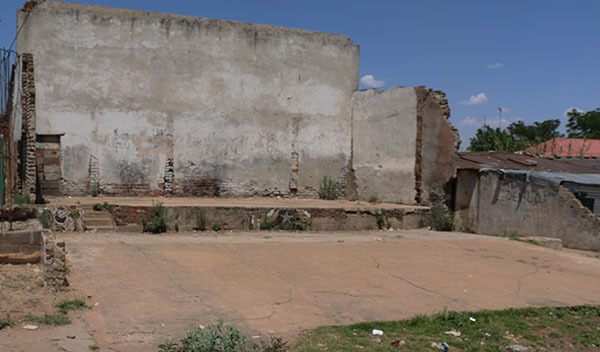 ENTERTAIMENT ZONE: The remains of the first bioscope in Kliptown. Tarr takes out his patterned handkerchief and wipes off beads of sweat on his forehead. “One day the police came, the special force, the mlungus. They couldn’t find anything because the people just mingled with others and walked out in different exists. The late Ahmed Ballim who bought the bioscope from San Souci in 1960 sat down with European researcher and author, Benoit Allanic in 2000 and reflected on the period when the bioscope was running at a loss. “People didn’t want to watch romantic movies,” says Ballim. Professor at the School of Civil and Environmental Engineering, Yunus Ballim who is the son of the late Ahmed Ballim describes San Souci Bioscope as a central gathering point, a source of entertainment and a form of political education. “My father and Hassan [his friend] took over [the bioscope] in 1960. I got more of my education in the cinema than I got in school,” says the professor with a broad smile on his face. In the same interview with Benoit Allanic, the late Ahmed Ballim reflects on a sad Monday when he found the bioscope damaged and vandalised. A few houses away from the bioscope is another landmark. Constructed with face brick, patched with cement to prevent it from falling, and dead grass lining around the house. 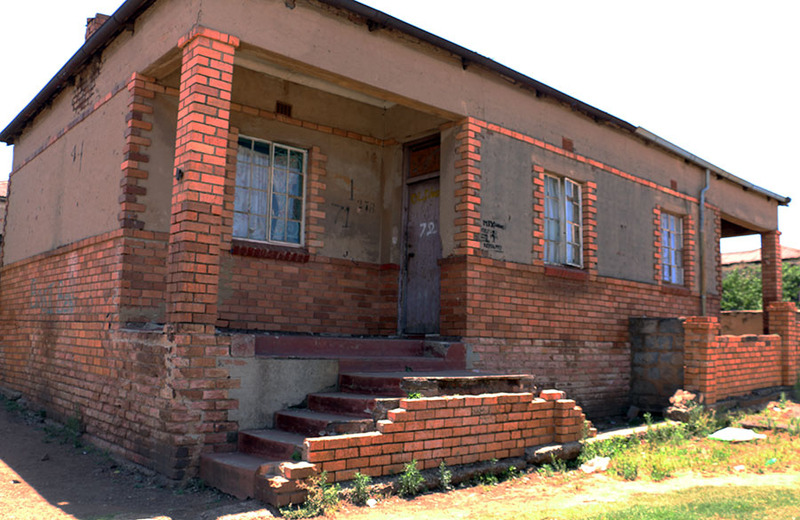 The two bedroom house belongs to Augusta Lollan, the mother of a well-respected political activist and the Secretary of the South African Coloured People’s Organisation in 1953, Stanley Lollan. According to Stanley Lollan’s late brother, Oom Poto, Lollan was a close friend of Nelson Mandela, and provided his friend a hideaway from the police force during Apartheid. Lollan passed away 33 years ago, however, his brother the late Oom Poto sat down with Benoit Allanic on April 2000 to reflect on the days when Nelson Mandela used to hide in their house and hold secret meetings. “Mandela was a great friend of my brother. He started [hiding in the house] in 1947 until they were arrested. They went to jail, they were arrested for treason. They were on trial in 1962. It must have been in the early ‘50s when they were arrested for high treason. The great grandchild of Augusta Lollan, Beryl Bullock who is in her late 30s says she still remembers the stories she was told about how Mandela use to hide in the house that she lives in. “When I was young, kids use to ask me to show them where Mandela used to hide,” she says. She welcomes me inside the house, as I sit on a hardwood chair that is upholstered in leather, I was immediately intrigued by the old furnisher that stores the memories of this historical house. “He used to hide over there,” Lock says as she points underneath a single bed in the bedroom facing the kitchen. HIDE AND SEEK: The Lollan house was a hidding spot for Madiba during apartheid. 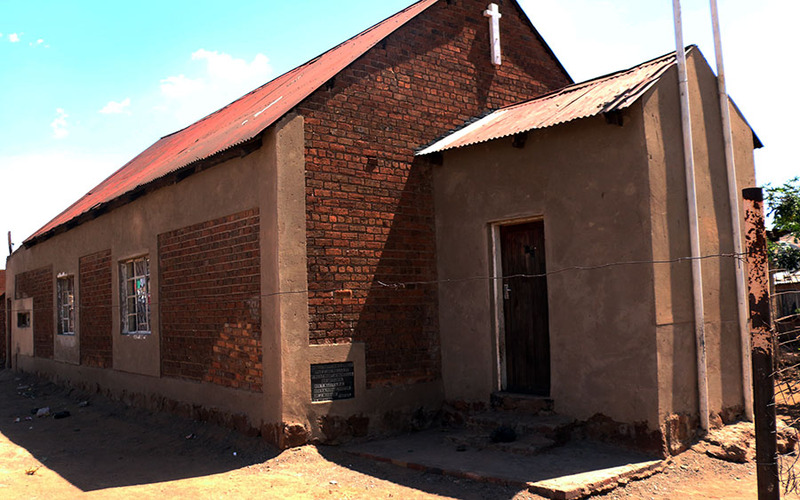 PRAISE AND WORSHIP: The Charlotte Maxeke Memorial Church brings hope to the community since it was established. In 1998, Nelson Mandela visited a 96-year-old Augusta Lollan at Eldorado Park where Lollan was staying before she passed away. In a scene captured by AP Archive, Mandela refers to Lollan as his comrade. “It’s an honour for me to stand beside comrade Lollan, because she was my comrade in those worst days before prison and I’m happy to be here today with her.” says Mandela wrapping his arm around Lollan’s hunched shoulders. The Lollan house is not a tourism attraction because it is home for Lollan’s great grandchildren. Another historic landmark is a church situated at First Street of Kliptown’s poorest community called ‘Dark City’. Surrounded by a collection of rusty cramped corrugated iron frames, and garnished with scattered pieces of plastics, cans and used diapers, the church remains a place of hope for the poor community. Charlotte Maxeke, one of South Africa’s first black female graduates and activist, is linked to the history of the church. She is the founder of the church and played a pivotal role in multiracial movements and protests. Today the church is known as Maxeke Memorial Church. It was an essential space during the apartheid regime, and used by political leaders as a meeting place. Reverend Blom who delivers Sunday sermons at the church says “Maxeke was a member of the Methodist Episcopal in America. The church honoured her by naming it after her. I also know that Political leader held their meetings here [at the church].” he says. Some people believe that the Freedom Charter was signed at the AME Church. A Kliptown community leader and the CEO of Greater Kliptown Development Forum, Gene Duiker says “The freedom charter was not signed at the church. The delegates did not sign the Freedom Charter, they adopted it by show of hands,” he says as he slowly grabs the bottle of Castle Milk Stout and pours into a facsimile of a Gleincairn whisky glass, sitting at the local tavern. Opened in 2003, Oom Bolo’s Museum is a significant building that preserves the historical and artistic items and household pieces that represent the old Kliptown. The museum is situated at Beacon Road, and was founded by a cultural and art activist, the late David Meyers, who is famously known by the community as Oom Bolo. In the 90s the building was a butcher shop, and was later transformed into a museum. “The museum was created to continue to give people a connection with the old lifestyle. Meyers passed away last year, and the museum has been closed since then. “The museum is closed because of family feud. 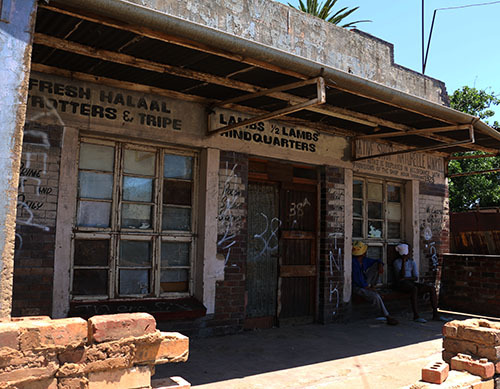 PRESERVING HISTORY: Kliptown residents still gather outside the closed museum. The mother of Meyers’s late girlfriend wants to take charge. The previous owner of the building also wants to claim back the place,” Jantjies says. Despite Kliptown’s well-known historical significance and high-cost constructed square, the community sees no beneficial effects. “Kliptown is a historical place, yet people still live in shacks or what they call ‘informal settlement’ a new fancy name. People don’t even benefit from that square. Where is the running water? Where is electricity? Where are the sewage pipes?” Duiker asks with a forced smile.